Ask fellow campers about "RodeHome RV Park" and nearby attractions. We were the only RV in this parking lot/RV park on the night we stayed in Larned. It is really a level, gravel-surfaced truck park with 12 side-by-side, FHU RV parking spaces added down the center. It is located next door to, and managed by, the Rodeway Inn (hence the "Rode" in the name). No trees, no landscaping, no shade, no pool, no playground, no fence, and no other "RV park" amenities. 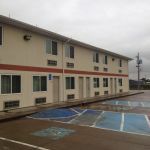 However, RVers can use the nice, warm restroom inside the motel and there is free coffee and buffet breakfast in the morning. I doubt anyone would ever need a reservation there, but it was convenient for a cold, off-season, single-night stay on the way to other places. We camped at RodeHome RV Park in a Fifth Wheel. A convenient place to stay when visiting the terrific Ft. Larned National Historic Site just west of town. The RV park is across the street from the golf course and next door to a Pamida store/pharmacy. Are you affiliated with RodeHome RV Park ?